Make your own mouse pads with extra large size. Just send us your artwork, tell us the size and others requirements. 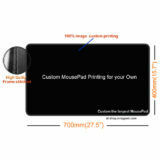 The mouse pad sizes are Max length is 700mm, or Max width is 400mm. They are extra large sizes mouse pads of custom printing and high quality Frame stitched. You offer an artwork, we do mouse pad printing for you!